“Refill the Well” was the focus of the 2nd Red Tent Event that I held in York Pennsylvania this past June. Women, across several generations, came together to experience techniques & share their wisdom regarding ways to take care of ourselves so we have more to give– refilling our wells. I believe that nourishing & nurturing ourselves isn’t selfish or self-centered; it’s self-preservation. 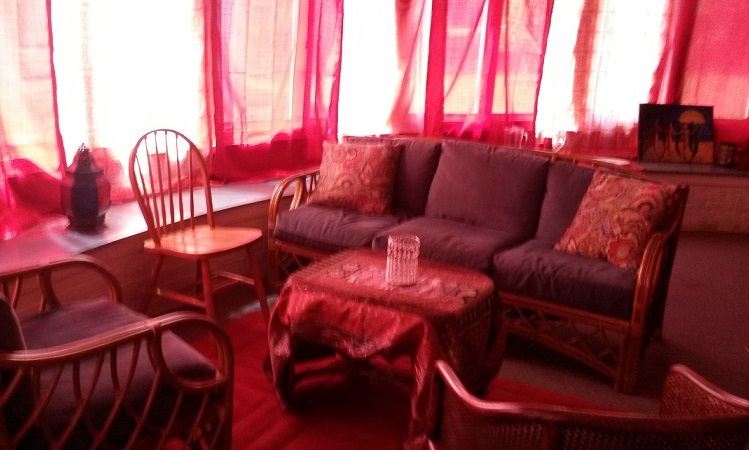 An inviting place to gather with women & share our stories. 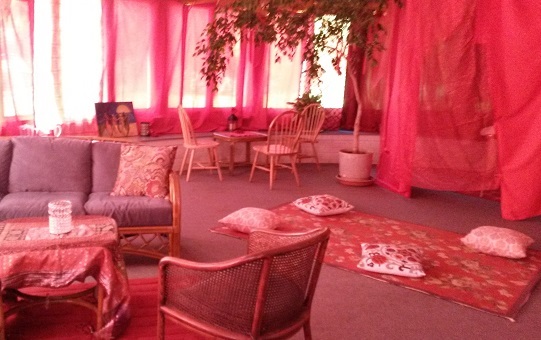 Each Red Tent Event that I host strives to be a balance between quiet time to reconnect with one’s highest self through meditation, journaling, or art as well as social time to connect with other women in a safe, sacred space. Spaces for women to gather in community or take time to be alone with their thoughts and feelings. 1) Visualize a sacred space within yourself. Here you can dance, connect with ancestors or other spirit guides, and tap into your own intuition. 2) Write your thoughts and feelings in a journal. For some, this daily practice is enlightening and often points the way to solutions. It also lightens the heart & spirit by putting concerns on paper rather than dwelling on them. 3) Take time to be in nature. I shared that I occasionally set “intentional” walks with my dogs. One morning, I may decide to focus on the sounds around me; another morning, I might focus on the sights in the neighborhood. This practice keeps me grounded & present. It feeds my soul. 4) Try yoga. It connects body, mind, & spirit through a variety of postures. Some find this calming while others find it energizing. All that tried it expressed it’s benefits in their lives. 5) Schedule an appointment with a Reiki practitioner. Reiki is the exchange of universal life force energy through light touch or a hands-above-the-body approach. 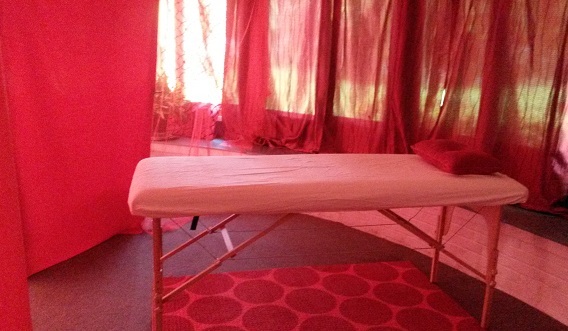 As you can see from the picture below, I set up my Reiki table behind some red curtains so that each person could experience it for herself. A secluded area in the tent for Reiki sessions. Magic happens when we stay present in the moment. Without any prompting, women seemed moved by the moment & offered their gifts to one another. One woman gave bodywork consultations, another gave individualized yoga training, and another gave Tarot readings! The beauty of the Red Tent lies in the beauty of each woman who enters with her own unique blend of experience, wisdom, & talent. By sharing these gifts with one another, we lift each other up in loving arms of support & encouragement. Throughout the day, we were each teacher & student, safe to be our authentic selves. The cornucopia of positive energy & acceptance overflowed. I’m looking forward to our next event in September, when the focus will be “In Celebration”, celebrating what is unique to each of us & honoring our beauty inside and out. Details can be found on this website under “Events” or on my Facebook page. Also, we are now registered on http://www.redtentmovie.com/red_tents_near_you.html . This entry was posted in A Window on Life, It's All Connected: Spiritual Musings and tagged balance, healing, health, life, nature, Red Tent, self-awareness, women, writing, yoga by puresusan. Bookmark the permalink.